Nayri Life and Spa is a very unique project that offers a prime location with a great architectural design that combines different elements to create a nice environment with ample entertainment areas, with all the necessary amenities for a higher comfort of residents. 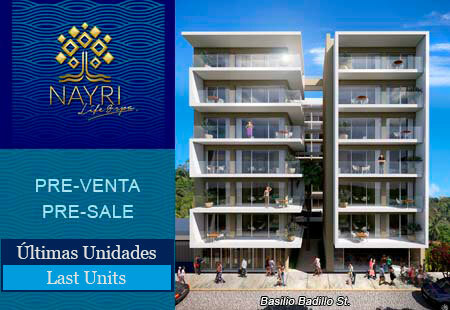 Nayri Life and Spa is one of the few privileged properties located just a few steps from the famous "Los Muertos Beach" in Puerto Vallarta downtown. Romantic Zone offers a wide variety of restaurants, bars, art galleries, shops, arts and crafts, services, as well as the warmth and folklore of the Mexican culture and people of Puerto Vallarta. The roof garden offers infinity pool, jacuzzi, long chairs area, bar area with TV, grill, lounge area, gym, spa, sauna, steam room, lockers, restrooms, dressing rooms, multi-purpose mirror of water-terrace. On the ground level, there is Business center, restrooms, lounge area, concierge service, restaurant-bar, coffee and a real estate office. 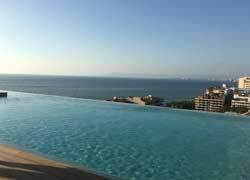 I would like to know more about Nayri Life and Spa Condominiums: Prime location in the romantic zone of Puerto Vallarta, Please send me information..